After my last blog about City land forms on Kuching Town in Sarawak and how land form Feng Shui has influenced the growth of that town. After that blog posting back in 2015, it drew praises as well as criticism from some Feng Shui critiques who do not understand the San Yuan Liu Fa system. Xuan Kong Liu Fa, also known as the Six Method, is an extensive system that deals with major land formations right down to small properties within the San Yuan School. It is a system that is not well known and relatively little source from the internet. This system has 2 major origins, one from our lineage and the other is from Taiwan. There is some variation in the system from the 2 sources as well. Taiping is one of the few towns in Malaysia that still carries a Chinese meaning 太平 behind that means eternal peace. 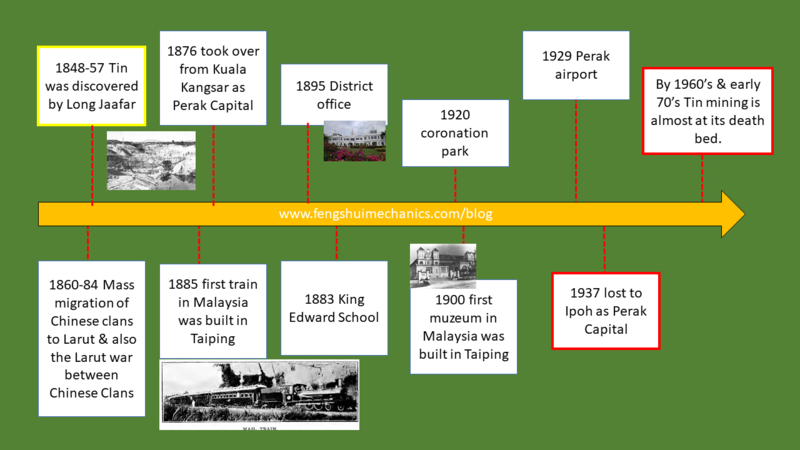 Taiping as a long history and you can read about it in Wikipedia as well as a few other sites listed below. I have made a simple time line on the history of this town. Kuching is the capital of Sarawak State, part of Malaysia located in the Borneo Island. The city is situated on the Sarawak River at the southwest tip of the state of Sarawak on the island of Borneo and covers an area of 431 square kilometres (166 sq mi) with a population about 165,642 in the Kuching North administrative region and 159,490 in the Kuching South administrative region. Kuching has a unique history where Kuching was the third capital of Sarawak in 1827 during the administration of the Bruneian Empire. In 1841, Kuching become the capital of Sarawak after Sarawak was ceded to James Brooke for helping the Bruneian empire in crushing a rebellion. The Brooke dynasty ruled Sarawak for a hundred years and became famous as the “White Rajahs“, accorded a status within the British Empire similar to that of the rulers of Indian princely states. In contrast to many other areas of the empire, however, the Brooke dynasty was intent on a policy of paternalism to protect the indigenous population against exploitation. They governed with the aid of the Muslim Malay and enlisted the Ibans and other “Dayak” as a contingent militia. The Brooke dynasty also encouraged the immigration of Chinese merchants but forbade the Chinese to settle outside of towns to minimise the impact on the Dayak way of life. Charles Brooke, the second White Rajah of Sarawak, established the Sarawak Museum, the oldest museum in Borneo. In the early part of 1941, preparations were afoot to introduce a new constitution, designed to limit the power of the Rajah and give the people of Sarawak a greater say in government. Despite this democratic intention, the draft constitution contained irregularities, including a secret agreement drawn up between Charles Vyner Brooke and his top government officials, financially compensating him via treasury funds. Until 1963, Sarawak joined Malaysia together with Sabah. Here is a brief chronological events of Sarawak. From the Feng Shui point of view, you will see that Kuching is surrounded by a network of rivers. The main river that divide the city into 2 half is the Sarawak River. The part labeled A is more prosperous and was firstly developed. The part B is more recent and quiet area mainly comprising of Government administration buildings.